This is an inexpensive colorimetric assay for measuring calcium in water. Consists of two solutions, Calcium Hardness CH1 and CH2. A purple/violet color is formed which is read with a colorimeter. This assay appears to be based on the O-cresolphthalein complexone calcium colorimetric assay. Calcium in alkaline solution reacts with o-cresolphthalein complexone to form a purple complex proportional to the calcium concentration. Magnesium ions, which also react, are removed by 8-quinolinol or 8- hydroxyquinoline. The reaction of calcium with o-cresolphthalein produces a purple/red complex at pH 10-12 with an absorbance maximum at 575 nm. 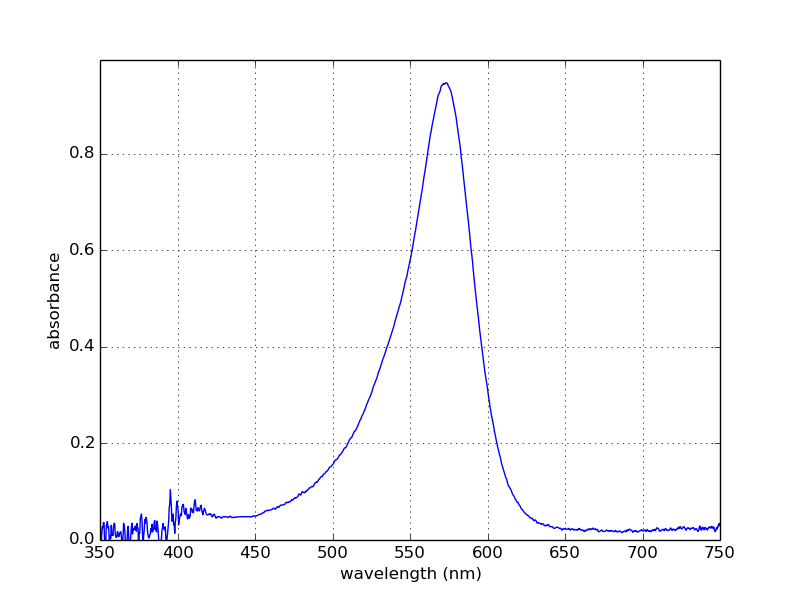 The intensity of the color, measured at 575 nm, is directly proportional to calcium concentration in the sample. Ethanolamine is used to achieve a high-buffered pH. 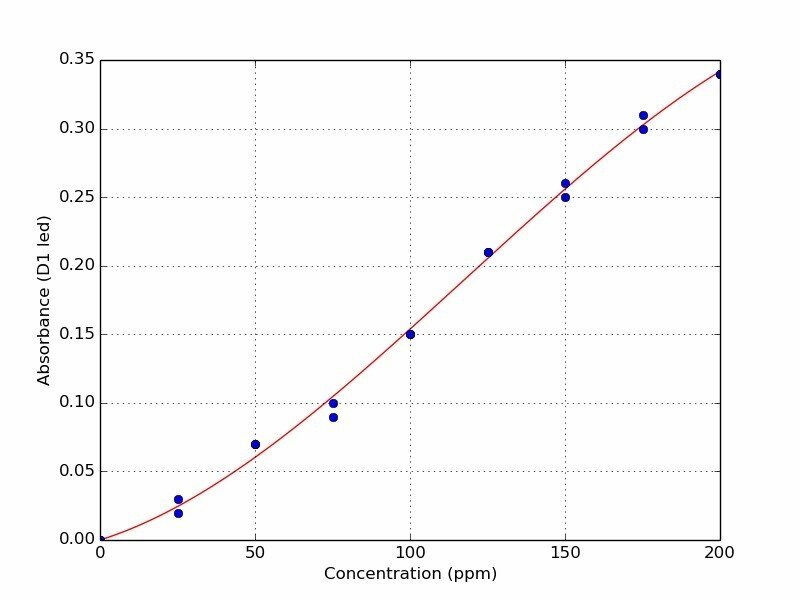 First we prepared a solution using tank water or a calcium solution and absorbance of the pink colored solution was measured using an Ocean Optics USB 2000 spectrometer. Peak absorbance is at around 575 nm. The standard RGB LED in the colorimeter has wavelengths of 470/528/625 nm. So, for this assay none of these wavelengths will work. Found a 575 nm LED from Digikey. Part # 160-1947-ND. Below is a transmission measurement from this green LED. Calcium = 1,000 ppm (1mg/ml), Hach # ?? After some preliminary measurements, appears that the best range is 0-200 ppm. Dilute standard to 250 ppm >> e.g. 5 mL standard + 15 mL distilled water. Prepare the following nine calibration solutions. Add 5 drops of CH1, mix, add 5 drops of CH2, mix. Measure with the custom 575 nm LED.